The New York Times reports that the American Academy of Pediatrics has issued new guidelines this week, to "aggressively screen and medicate for high cholesterol in children". Dr. Jatinder Bhatia, a member of the academy’s nutrition committee is quoted as saying: "We are in an epidemic". He also said that "The risk of giving statins at a lower age is less than the benefit you’re going to get out of it." Bhatia added that the drugs were "generally safe for children", although he admitted that there was not "a whole lot" of data on pediatric use of cholesterol-lowering drugs. I suppose that "not a whole lot of data" means he could not find a study specifically testing statin drugs on children. With the Academy of Pediatrics showing so much zeal for foisting a dangerous and at the same time rather useless kind of drugs on children, one would suspect that scientific honesty has been overridden by a more powerful motivation. Indeed, it seems that the academy is well financed by pharmaceutical interests. “Friends of Children Fund” Annual Report, July 1, 1996 - June 30, 1997, indicates $2.085 million in funding from corporations. Donors include Procter & Gamble, Gerber, Infant Formula Council, McNeil Consumer Products Company, National Cattlemen’s Beef Association, Johnson & Johnson Consumer Products, Abbott Laboratories, Wyeth-Lederle Vaccine & Pediatrics, Mead Johnson Nutritionals, SmithKline Beecham Pharmaceuticals, Schering Corp., Rhone-Poulenc Rorer, Food Marketing Institute, Sugar Association, International Food Information Council, Merck Vaccine Division, and others. Side effects of cholesterol lowering drugs are numerous and serious. But then - what is a bit of pain or loss of memory when there's so much money to be made? "Dammit. This is the last straw," comments Vince Boehm, as he says: "They are pushing cholesterol-lowering drugs for children." Vince has some pertinent comments that underline how perfectly useless those drugs are for anyone - let alone children - and how even the FDA says there are serious side effects to be expected. Sales of cholesterol-lowering medications - statins - rose by 156 percent between 2000 and 2005, according to the US Agency for Healthcare Research and Quality. 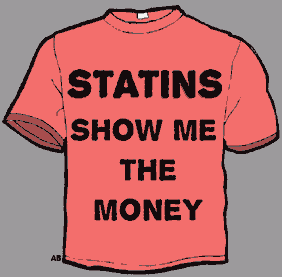 The number of people obtaining a prescription for a statin nearly doubled, from 15.8 milllion to 29.7 million. Looked at another way, the number of outpatient scrips rose to nearly 174 million from about 90 million. this is a S19.7 billion business. A massive percentage of the adult U.S. population takes these with an almost religious fervor. These products are sold on the premise that they reduce the risk of heart attacks and strokes. Surely there should be an equally massive shift in the numbers - somewhere. But, a review of the Center for Disease Control numbers shows nothing of the kind. The rate per 100,000 population for these deaths has not changed for the last 60 years. These products have been on the market since 1976. We should be seeing a very sharp measurable decline in deaths in these categories considering their almost universal use. So? What is the actual risk? Evidence based medicine shows this from a recent paper* published in Lancet. "... the absolute risk reduction of 1.5% is small and means that 67 people have to be treated for 5 years to prevent one such event. Further analysis revealed that the benefit might be limited to high-risk men aged 30-69 years. Statins did not reduce total coronary heart disease events in 10,990 women in these primary prevention trials. Similarly, in 3,239 men and women older than 69 years, statins did not reduce total cardiovascular events. "Our analysis suggests that lipid-lowering statins should not be prescribed for true primary prevention in women of any age or for men older than 69 years. High-risk men aged 30-69 years should be advised that about 50 patients need to be treated for 5 years to prevent one event." So why give these products to kids? Clearly the C.D.C. numbers show us no measurable favorable outcomes over a thirty year period. The Lancet piece above says these products should not be given to females of any age. A recent class-action lawsuit alleges statins increase the risk of heart attacks by 10% in women. So that leaves the girls out. There is an enormous "needed to treat" number in males from ages 30 to 69, and even this marginal figure is being contested as being too low. Finally these substances should not be given to those males over 69 as a routine primary preventative. So what about the kids? What can they expect as they get older? The FDA-labeled long-term downside risks of statins include acute liver disease and serious problems in pregnancy and breast feeding, myopathy (neuromuscular disease), rhabdomyolysis (rapid breakdown of skeletal muscle tissue), myalgia, pain in extremities and abdomen, Angioedema (rapid swelling of the skin, mucosal and submucosal tissues), hepatitis, eczema (skin inflamation), fatigue, headache, influenza, pharyngitis, sinusitis and upper respiratory tract infection surely cancels out any concievable "benefit" to children. Many children will be misdiagnosed and labeled with psychiatric problems as a result of these physical problems. This opens up another basket of problems. If there is only self-serving hypothetical "benefits" to predict outcomes and the problems are well known, then why put kids at risk? "To be frank, I'm embarrassed for the AAP today," Lawrence Rosen of Hackensack University Medical Center in New Jersey, and vice chairman of an academy panel on traditional and alternative medicine, tells The New York Times. "Treatment with medications in the absence of any clear data? I hope they're ready for the public backlash." Cholesterol Scam Exposed - Throw Away Your Statins!